Last year was Super Mario's 25th anniversary. To celebrate, Nintendo released Super Mario All-Stars Limited Edition for the Wii. This year is Zelda' 25th anniversary. Nintendo is celebrating with an orchestral concert, special designs on their shop cards, and Four Swords as a DSi download. 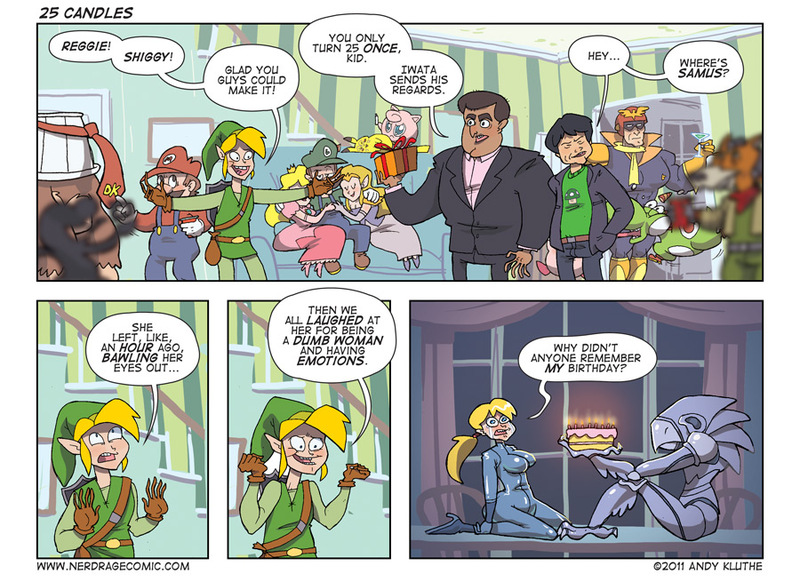 But it's also Metroid's 25th anniversary -- why isn't there a celebration for Samus? Coverage on the 3DS Slide Pad Expansion continued, detailing the device's requirement for a AAA battery. While Kotaku continues to beat the 3DS's shortcomings into the ground, while IGN gives a hands-on review of the device that says "it's not that bad". Sony has released their own information on the Playstation Vita which looks...troublesome, to say the least. Remember when they emphasized being always connected through 3G? Well, good luck with that. Kaz got laughed at and booed on stage during E3 when he announced the the AT&T partnership. But in Japan they're forming a partnership with Docomo -- and you must by your time in $13, 20-hour chunks or $65 100-hour bigger-chunks. Oh, and they expire. Cool story, Sony. Oh, and what's that? Another company doing AR games? The for-realsies version of Minecraft 1.8 is out. From what I've been able to explore, the bigger biomes are amazing, NPC villages are cool, and printing is awesome. Now the long wait for 1.9. So that Mojang can finish these features, by adding an actual purpose for experience. And NPCs in their villages. And fix snow biomes. For those that hate 'New Kotaku', I've put up this little design.